With the use of a suspended silk hammock, you can experience yoga in an entirely new way. Aerial yoga gives you the opportunity to try different poses that you may not be able to do in a regular yoga class and encourages you to let go of fear and trust yourself. In this class you will develop strength, flexibility and become comfortable hanging around upside down! No aerial yoga experience necessary. Please reserve as spots are limited. Ashtanga Yoga is a series of yoga asanas (postures) developed by Sri K. Pattabhi Jois. This traditional style of yoga follows a set sequence of postures that are coordinated with specific breath counts, aimed to bring vibrancy, strength and clarity to those who practice it. This class will be challenging but extremely rewarding. Ashtanga Yoga acts as a vehicle to greater self-awareness and self-compassion. All levels. Hatha is the oldest form of yoga known today. It is perfect for beginners as it creates a stable foundation and understanding of the primary postures and breathing exercises used in all yoga classes. In this class you will develop strength, flexibility and balance while learning how to breath consciously. The hatha flow class links postures together in a fluid sequence moving from one posture into the next. Recommended for beginners. Accessible for all. To replicate the temperature in India, our studio is heated to 35-38 degrees Celsius with 50% humidity. The heat allows the muscles to become warmer faster which increases flexibility, provides a wider range of movement and reduces the risk of injury. It is a challenging and empowering workout that detoxifies and tones the entire body. In this class you will develop strength, flexibility and increase your cardiovascular system. Get ready to sweat! This deep stretching class is a combination of stretching and meditation aimed to bring elasticity, flexibility, and fresh oxygen into the muscles. It is a great way to release tension in the body, free up accumulated lactic acid, and restore muscle fibres. In this class you will develop flexibility while learning how to breath in the present moment. All of the postures are done seated or laying down on the floor. Accessible for all. Morning Flow is designed to awaken your body, bringing you energy and vitality for the day ahead! In this class you will move through a series of postures linking your breath to your movements. This style of yoga develops strength, flexibility, balance and coordination. A morning yoga practice is the best way to set the tone for the rest of your day. Accessible for all. In this yoga class we strive to find balance by experimenting with two opposing worlds: yang and yin. Part one of the class is dedicated to a vigorous flow yoga styled practice, that will wake up the body with continuous movement and conscious breath. The second part of the class will be dedicated to relaxation, stillness and letting go in postures that are held longer, allowing for a deeper practice and introspection both physically and mentally. Recommended for intermediate students. Accessible for all. Vinyasa simply means “linking breath to movement” and is often known as “Flow Yoga”. In this class you will move through a series of postures linking each movement to your breath. It is an energetic class that develops strength, stamina and flexibility through a dynamic practice of continuous movement. This class is recommended for intermediate students. We are taking relaxation to the next level with Yin + Massage! This class will include all of the best hands on adjustments and massage techniques done by registered massage therapist Mélissa Laflamme. This deep stretching class is a combination of stretching and meditation aimed to bring elasticity, flexibility, and fresh oxygen into the muscles. It is a great way to release tension in the body, free up accumulated lactic acid, and restore muscle fibres. 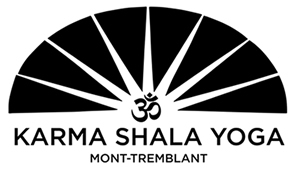 In this class you will develop flexibility while learning how to breath in the present moment. All of the postures are done seated or laying down on the floor. Accessible for all.